Calling in Cardiff plus a new dance! Home→Uncategorized→Calling in Cardiff plus a new dance! Last night I was calling at RUFF Ceilidhs in Cardiff with the fantabulous Steamchicken! A great night was had by all, so I thought I’d share this photo 🙂 Thanks to everyone who came along, and to the organisers for inviting us – hopefully we’ll be back before too long! Another great thing about last night was the successful outing of a new dance – ‘The bibbity bobbity boo one’ (as dubbed by one of the dancers!). 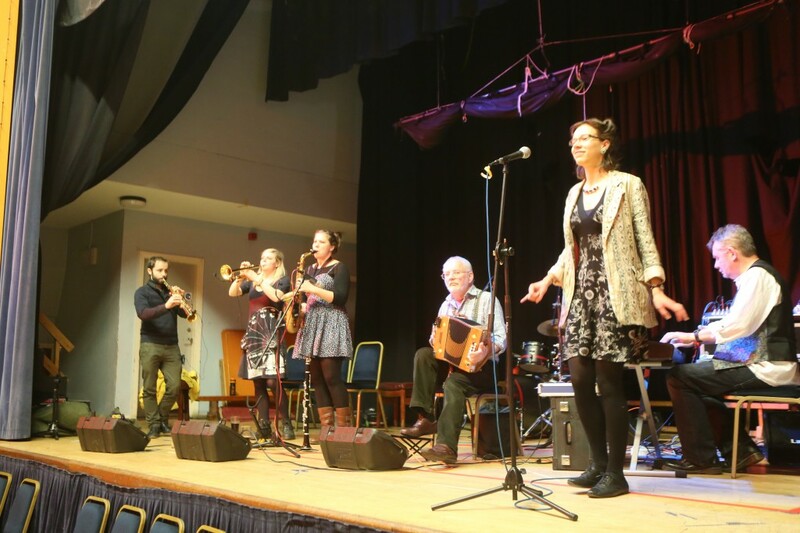 It’s based on the contra dance ‘Old Time Elixir #2’ by Linda Leslie, with the intention of being a contra style ceilidh dance that includes the move ‘balance the ring and petronella’ – one of my favourite contra dance moves! I also like the ‘slide left’ progression because it flows really nicely but doesn’t usually come up in ceilidh dances. Anyway, here it is. As always feel free to use it and adapt it as you like! A1: (slide left to progress) circle left and right with couple opposite. After the swing walk sideways to the left as a couple to meet a new couple for the circle left.